The locksmith of yesteryear can't compete with the technology of tomorrow. Having just moved into a new apartment a few weeks ago, my roommates and I set off, New Jersey bound, for an Ikea adventure by way of my trusty ZipCar membership. Panic ensued. I envisioned hours of humiliation as I awaited Pop-a-Lock or AAA in the blue, yellow, and asphalt wasteland of the Elizabeth Ikea parking lot. However not having contact info for these organizations, I fought back tears and called the ZipCar customer hotline for help. To my ultimate surprise, I witnessed a miracle. After asking me several security questions, the lovely woman on the other end of the line sent an “unlock signal” to the car. Like the Red Sea parting, the lock latches rose from the door panels with a hearty “click.” Presto – I was in! I grabbed both keys and my ZipCard and met the roommates inside by the coffee tables. But the angst of the day, and my salvation, still plagued my mind. How did this masterful technology work? Where did the signal come from? Were there ZipCar satellites orbiting the Earth waiting for people like me to indulge their personal negligence? So, I contacted ZipCar to ask. “We have cellular communication with all of cars,” said Doug Williams, Vice President of Engineering at ZipCar. I think to myself, “Wow! So you can call your car like you call your buddies?” Not exactly. 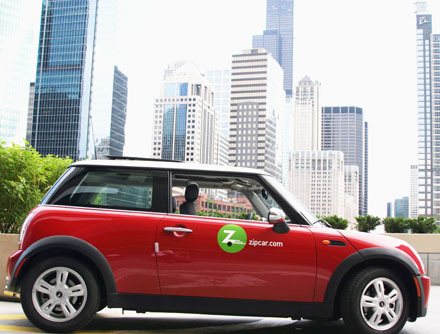 ZipCar uses the data portion of the standard GSM cellular networks, which are worldwide. It’s the same thing as the voice part of the cellular network, but it only works with data messages. The On-Star service uses both the voice and the data portion of the cellular network. The network is “prevalent, it’s worldwide. We use the same in the US, same in Canada, and the same in London,” said Williams. ZipCar has vehicles in all three countries. When the ZipCar angel sent the “unlock” signal to my car, the message went to a very small computer device that ZipCar puts in each of its vehicles. That microprocessor then sent a signal to the card reader on the vehicle’s windshield, which told it to unlock the doors. The card reader uses Radio Frequency Identification or RFID technology to identify a person’s ZipCard. If it’s the right person with the right card, the card reader sends a signal to unlock the doors. What he calls technology I call fabulous. And good news, New Yorkers. Kristina Kennedy, ZipCar’s Corporate Communications Manager, said ZipCar will possibly double their fleet in New York City over the next year. For more information, check out Molly Webster’s upcoming Scienceline story on RFID technology. I was actually tempted for a moment there to try driving in the city, just to see the car. Good stuff. I love the ease of using my ZipCar membership–helped me out of a few pickles. And I got to test-drive a hybrid in the streets of New York. Fun times! Ahh technology…. once again saving us from the imbicility innately passed down from our forefathers. If Archduke Franz Ferdinand had GPS he would have not taken that wrong turn into a bosnian-serb bullet, thus saving the world a giant waste of time. Actually, had he had GPS, things would have probably been no different, since GPS tends to get you lost as well… trust me! My question is this: how do I incorporate this technology into a five year old car? How about several cars?